PADI ADAPTIVE TEACHING SPECIALTY COURSE Build your professional capabilities in adapting to student needs. Have you ever worked with a student to overcome learning difficulties? Of course you have, the whole PADI system is aimed at customising training to students. The PADI Adaptive Teaching Specialty Course aims to provide PADI professionals from Divemaster upwards with the tools to have not just one method of teaching but a plan b, c and d until a solution is found for any challenge presented. Be EFR primary & secondary care certified within 24 months. The challenging part of this course is opening up your teaching style to accept alternate techniques and methods. Most PADI Pro`s are adept at handling change, so this could be said to be the fun part too! During the course you’ll learn how to help students with physical and mental challenges adapt techniques to achieve performance requirements. One Knowledge Development Session & accessibility workshop. Two confined water skill development workshops. Learn new adaptive techniques to use while supervising and training divers/freedivers with disabilities in PADI courses and programmes. Properly council and direct student divers, based on their abilities toward PADI certification, PADI experience programmes or towards a disabilities-dedicated diving organisation. Explore additional ways to motivate and encourage student divers with mental and/or physical challenges. Complete the PADI Specialty Instructor Course with Diveworlds Course Director. Apply directly to PADI with proof of training in adaptive techniques and/or experience training divers with disabilities from a dedicated diving organisation. 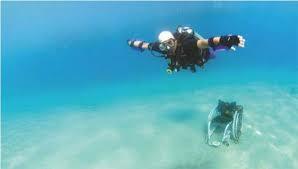 This is a standardized specialty so may be credited towards PADI Master Scuba Diver. All the usual scuba gear as set out in PADI Standards plus specialised equipment such as webbed gloves for example. Contact us at Diveworld to book your PADI Adaptive Teaching Specialty Course. If you are wondering if the course is for you please call in for an informal chat to discuss any queries you have.